The three case files of United States ex rel. Rodriguez v. Hughes, et al.… explore the suit brought by Juan Rodriguez, a prominent engineer, who acted as a whistleblower against his employer, Hughes Aircraft, for violations of the False Claims Act. Richard Hughes (CEO of Hughes Aircraft) learned that the United States Department of Defense (DOD) was looking for a new helicopter to provide to the Mexican government as part of the United States’ Mérida Initiative, which provided Mexico resources to help it fight its war against the drug cartels. Hughes, on behalf of Hughes Aircraft, entered into a sole source contract with the DOD. Hughes was favorably positioned to do so as it was the sole manufacturer of the Screaming Eagle helicopter S-70, the model the DOD was seeking to purchase. 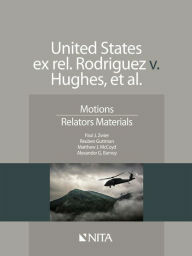 Rodriguez’s employment background put him in a position to ascertain whether his employer, Hughes Aircraft, was making false claims to the DOD. Initially, Rodriguez had been employed at Sikorsky Aircraft Inc., a predecessor of Hughes, working in the design and manufacture of the first Screaming Eagle helicopters. Later Sikorsky Aircraft was bought by Hughes Aircraft. During his tenure at Hughes, Rodriguez had designed and retrofitted early versions of the Screaming Eagle helicopter. When retrofitted with heavy missiles, one of the first versions, the UH-A, suffered cracks on landing. Accordingly, metals intended to help crash-proof the helicopter were added to the design. Hughes also started to employ Magnaflux testing to ensure that later versions of the Screaming Eagle did not have subsurface cracks. Rodriguez claims that he saw cracks in the cabin of one of the Screaming Eagles Mexico helicopters, and that he also saw workers welding over the cracks. Rodriguez claimed that he considered the welding over of cracks in the cabin of the Screaming Eagle a “cover up” of the failure to conduct testing and thus an act of fraud—passing on defective helicopters to the governments of the United States and Mexico. Available on line at Barnes & Noble.